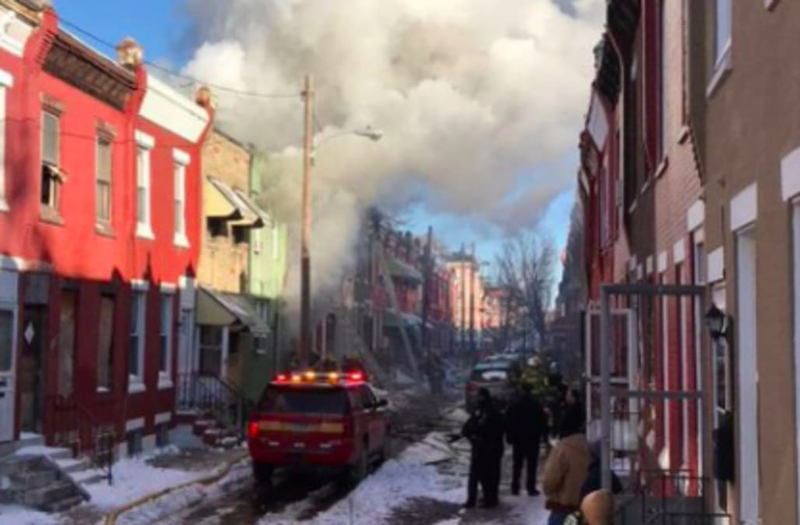 A Philadelphia firefighter was killed Saturday after being pinned down by debris while fighting a two-alarm blaze in a house that also killed a civilian, according to Fire Commissioner Adam K. Thiel. Philadelphia Fire identified the firefighter who was killed as 42-year-old Lt. Matt LeTourneau, an 11-year veteran of the department. The department did not immediately identify the civilian who was killed. LeTourneau was one of approximately 100 emergency crew members to respond to the fire, which was reported at 8:51 a.m. ET. He was injured when part of the house's structure collapsed. Thiel said LeTourneau was pinned beneath debris for approximately 30 minutes before rescuers were able to free him. He was taken to Temple University Hospital where he was declared dead around 11 a.m. ET. "All of the men and women of the Philadelphia Fire Department are heroes," Thiel said Saturday during a press conference. "From the day they take the oath to this city, they are heroes. Among those heroes, there are the pantheon of men and women who have made ultimate sacrifice. Today, tragically Lt. Matt LeTourneau joins that host of heroes. And our hearts are breaking." It is with great sorrow that I stand with Commissioner @ThielAdam today to announce the death of Lt. Matthew LeTourneau, who lost his life while fighting to keep the people of Philadelphia safe. I know our city grieves with all of our brothers and sisters in the @PhillyFireDept. Philadelphia Mayor Jim Kenney, who was also at the afternoon press conference, tweeted his condolences after the announcement of LeTourneau's death. "I know our city grieves with all of our brothers and sisters in the @PhillyFireDept," Kenney wrote. Two other firefighters were injured in the blaze, but were expected to be released from the hospital later Saturday. Thiel said LeTourneau did not have any children and his surviving family members had arrived at Temple University Hospital. All City of Philadelphia flags will be flown at half-staff for 30 days in LeTourneau's honor, according to NBC Philadelphia. An investigation into what caused the fire and an after-action review will be launched, Thiel said.